If you live in the small, rural town of Bobtown, Pennyslvania, you woke up to quite a scare last week courtesy of a pretty horrible explosion over at Chevron's nearby fracking site. So how's Chevron going to quell fears about that giant column of flames and possible residual toxins? Who cares! Your next large pizza and two-liter soda are on the house. At least, that seems to be the thinking behind Chevron's notably bizarre act of contrition, which came attached to an otherwise unexceptional apology note. Attempting to distract residents from a natural gas well explosion with the promise of a free meal (Special Combo only) is odd enough, but in light of how terrible this particular accident was, the offer seems downright insulting. It was a horrific event on every level. One worker at the rig was not found and is presumed dead. The fire — which posed enormous risks to rescue workers and to the surrounding community — burned intensely for five days before it was finally extinguished. Despite reassurances, neighbors surely worried whether toxins were released in the fiery aftermath. 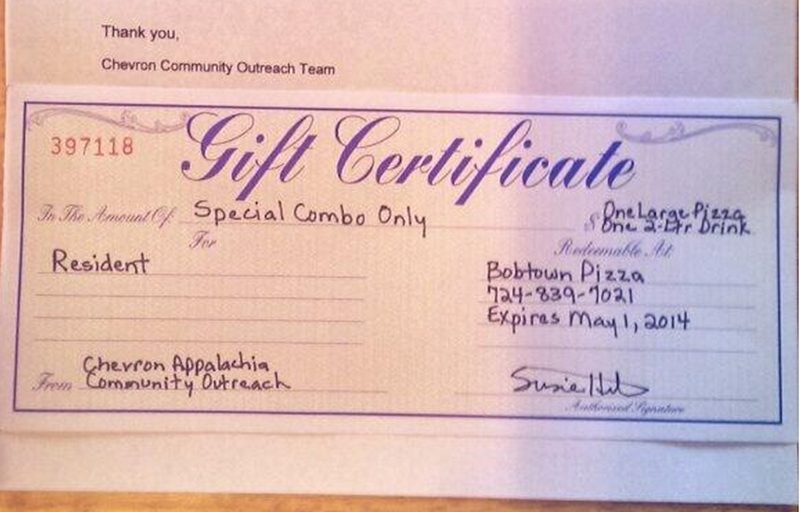 The Philadelphia Daily News also managed to speak directly to Bobtown Pizza, which was able to confirm that Chevron did indeed distribute about 100 of the gift certificates to homes around the area. We've reached out to Chevron for comment and will update as soon as we hear back. The situation at the Lanco well site in Pennsylvania remains serious and teams are working around the clock to safely approach and shut in the well. There has been considerable construction activity adjacent to the site, resulting in increased traffic and congestion in the area. Recognizing that our neighbors have been affected by these activities, we are out in the community every day to listen to and address concerns. We have also offered a token of appreciation for their patience during this time, and our commitment to the community goes far beyond this and our outreach is ongoing. Our thoughts remain with the family and friends of our missing colleague and we appreciate the strong support we have received from nearby residents as we work to respond to this incident in a safe manner.